Whisk all sauce ingredients together and add enough water to make the entire sauce mix approximately ½ a cup altogether. Prepare flat rice noodles as per the packet instructions and set aside. Grill chicken breast on a high heat for approximately 4 minutes on either side, or until cooked through, but still moist. Set aside to rest. In a very hot wok with plenty of oil, cook the vegetables in batches for a couple of minutes each. You want them to still retain some crunch. Set each batch aside. Toss noodles and all cooked ingredients, except chicken back into the wok, add sauce, and allow to reduce a by half. 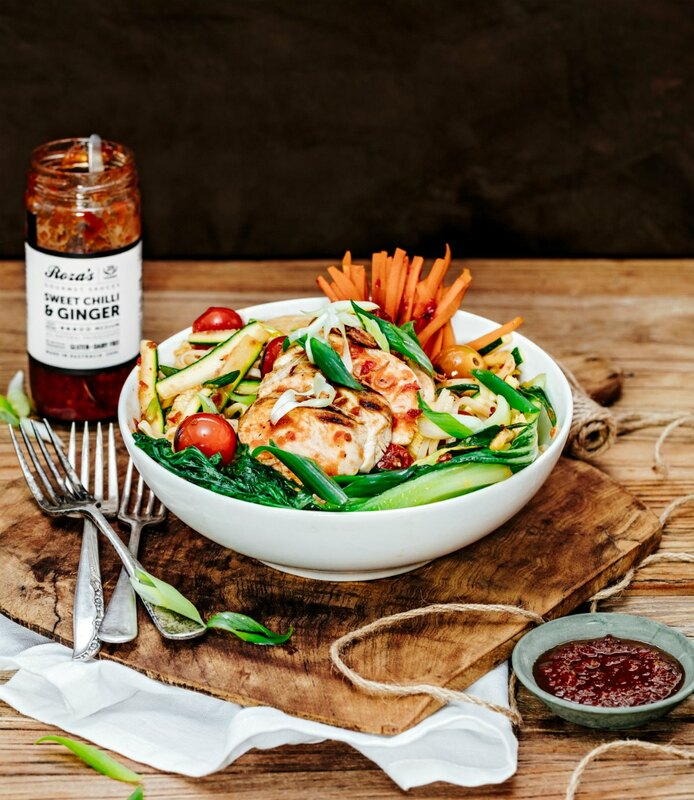 Add slices of chicken & toss three or four additional tablespoons of Sweet Chilli Sauce through the entire stir-fry. Serve into 4 bowls as season as desired.